The Manufacturing Technology Centre’s Factory in a Box initiative promises to spread the benefits of Industry 4.0. Shipping containers are the red blood cells of Industry. Identical and standardised, they carry all the elements needed for manufacturing – components, machinery and finished Items – around the world, circulating through shipping lanes, railway lines and motorways between the suppliers, manufacturers, and assemblers that make up the organism that generates income for businesses and nations alike. But now, those same containers will be able to form part of the organism itself. The Factory in a Box (FIAB) Initiative, part of the Smart Manufacturing Accelerator launched in March at the Manufacturing Technology Centre (MTC) in Coventry, turns these ubiquitous steel cuboids into manufacturing units in their own right. And not just manufacturing units. Assembling these major factories from scratch represents an ideal opportunity to use the latest industry 4.0 technologies, equipping all the equipment in the box with connected sensors that allow their operation to be monitored and controlled from anywhere in the world via a digital twin. There are several reasons why a manufacturer might want to investigate FIAB. It could act as a “taster” of industry 4.0 for their wider operation, and the MTC can work with companies on this basis, said Hannah Edmonds, technical specialist in the digital engineering group at the MTC, at the launch. It can modularise manufacturing or other operations so that it can be located at remote sites near to customers. In this case, assembling the units at a remote location allows all the systems to be fully tested and even commissioned before the modules are transported to their final operational site, allowing them to be up and running and productive very soon after they are installed. “It’s of particular interest to companies who want to spread their manufacturing around the world but keep their IP,” Edmonds commented. Part of the inspiration for FIAB came from Elon Musk, who commonly refers to factories as products in and of themselves. Speaking about the manufacture of the Tesla Model 3 at the company’s 2016 shareholders meeting, Musk said “We realised that the true problem, the true difficulty, and where the greatest potential is – is building the machine that makes the machine. In other words, it’s building the factory.” The potential for improvement is an order of magnitude greater in manufacturing vehicles than in the actual vehicle engineering, he added. Tesla has the ambition of packaging the production system for its lithium ion batteries into a product that can be reproduced anywhere in the world: in a way, a Gigafactory in a box. The Smart Manufacturing Accelerator and FIAB initiatives are supported by a variety of collaborators and partners. The Energy Research Accelerator (ERA) is a partner: co-funded by innovate UK and comprising six Midlands-based research intensive universities along with the British Geological Survey, ERA is focused on delivering a range of specialist energy projects across the region, including a range of thermal and cryo- energy technologies to serve sectors including food, medicine and data. Among the technology partners are ABB, which has supplied robots; Autodesk, whose design software is integral to the task of packaging all the equipment and machinery necessary to carry out production inside the confines of a shipping container; GE; sensor specialist SensEye; Beckhoff, whose fieldbus helps to linkup the sensors to the control systems; predictive simulation software and modelling specialist Lanner; and Siemens. Other partners include Wonderware and Unison, whose automated robot path planner software helps guide the automated systems which carry parts from one manufacturing station to another. “Our involvement with the FIAB project has given us the opportunity to develop our capabilities for simulation and artificial intelligence and working on the ARPP especially has provided a greater insight into how robots could integrate with our software,” said Unison managing director Alan Pickering. Unison’s input has been particularly helpful for one the first projects to be completed by the FIAB team, a modularised system for building cryogenic pipe assemblies for Croydon-based company Dearman. The assemblies are part of Dearman’s transport refrigeration unit (TRU), built around a piston engine driven by expansion of liquid nitrogen or liquid air and capable of replacing diesel-powered refrigeration systems for trucking refrigeration that produces no carbon dioxide or air pollutant emissions. 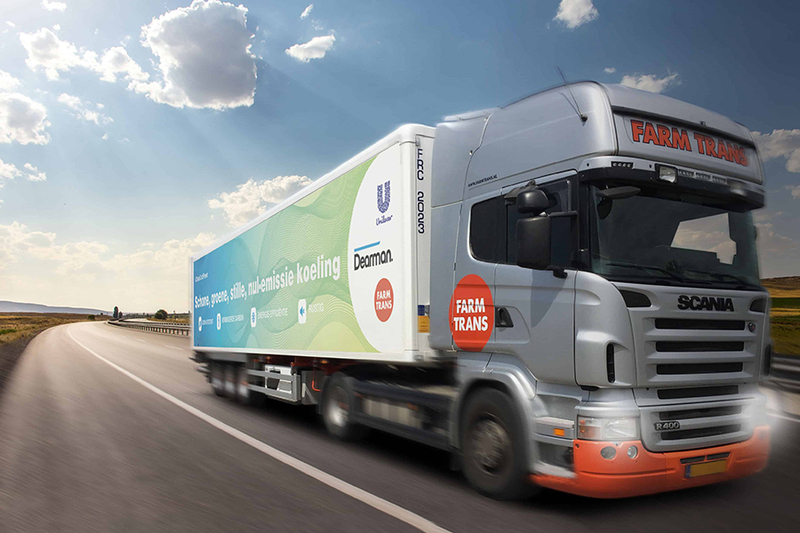 Using FIAB will allow Dearman to produce TRUs internationally, co-locating production with overseas vehicle manufacturers and integrators in developing countries. The industry 4.0 and digital twin functionality of FIAB will enable the company to monitor and maintain production remotely, including optimising manufacturing schedules and arranging predictive maintenance. 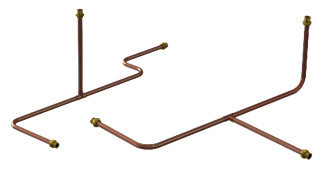 The cryogenic assemblies are made from 15.87 mm pay 65 copper pipe with 1.05 mm wall thickness. Each assembly can enter a maximum of two T-pieces with threaded end fittings. The FIAB unit contains several working stations, served by a robot which runs along a gantry installed in the container ceiling: at one end is racked storage for copper pipe pieces, and next to this is a CNC pipe cutter, which cuts pipe to length with the help of stock use optimisation to minimise wastage. The cutter also applies marking for traceability and quality assurance. The cut pipes are then carried to a brazing station where end- and T-fittings are attached. The end-fittings are attached to pneumatic testing connections at this point. The assemblies then move on to a CNC bending machine with a robot mounted end effector to set the correct geometry. Pneumatic testing of the assembly follows, and finally a machine vision station inspects the geometry. “The concept of distributing a working plug-and-play small manufacturing cell from within a forty foot shipping container that is monitored remotely from an overseas control centre is creating a succinct and yet still technically ambitious manifestation of IoT in action that Autodesk is proud to be a part of,” commented Chris Jones, senior product manager at Autodesk. The entire installation is mirrored by a digital twin which allows a real-time simulation of the process in schematic form to be viewed, while closed-circuit TV cameras also allow the robot and other equipment to be observed remotely.